HILL, John Boynton Philip Clayton, a Representative from Maryland; born in Annapolis, Anne Arundel County, Md., May 2, 1879; attended the common schools; was graduated from Johns Hopkins University in 1900 and from the law department of Harvard University in 1903; was admitted to the bar the same year and commenced practice in Boston, Mass. 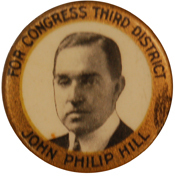 ; returned to Baltimore, Md., in 1904 and continued the practice of law; unsuccessful candidate for election to the Sixty-first Congress in 1908; United States attorney for the district of Maryland 1910-1915; unsuccessful candidate for mayor of Baltimore in 1915; delegate to the Republican National Convention in 1916; judge advocate for the Fifteenth Division, and attached to the Fourteenth Cavalry, Mexican border service, from August 26 to December 15, 1916; during the First World War was major and lieutenant colonel in the United States Army in 1918 and 1919; elected as a Republican to the Sixty-seventh, Sixty-eighth, and Sixty-ninth Congresses (March 4, 1921-March 3, 1927); unsuccessful candidate for the Senate in 1926; unsuccessful candidate for election in 1928 to the Seventy-first Congress and in 1936 to the Seventy-fifth Congress; moved to New York City in 1937 and continued the practice of law; returned in 1940 to Annapolis, Md. ; died in Washington, D.C., May 23, 1941; interment in Arlington National Cemetery.